The word Pictograph comes from the Latin word 'pictus' meaning painted and the French word 'graphie' meaning to carve, "a writing, recording, or description" and was first used in reference to Native American art in 1851. 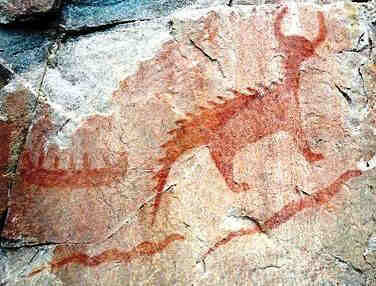 The purpose of Pictographs was to express artistic or religious meanings, acknowledge special events or were created as a form of magic or to illustrate mysterious Mythical creatures and monsters. The location for creating Pictographs was important because the paintings needed to be protected from the elements and erosion. The most common place chosen to create pictographs was in sheltered caves and large alcoves. The pictographs at Canyonlands National Park, Horseshoe Canyon in Utah are located in large alcoves protected from the sun and the rain. The above picture shows the 'Great Gallery' which is an extensive panel of Pictographs which contain depictions of dozens of mysterious, armless figures, up to 10 feet tall. The gallery extends across the canyon walls for over 200 feet. The pictographs have been created on light brown sandstone and painted in various shades of red and brown. The above pictographs at Lake Superior were created by the Ojibwa people and feature a canoe representing water and depictions of two serpents and a horned reptilian creature. The picture at the top of the page depicts a modern reproduction of the famous Piasa Bird Pictograph. Antlers and horns signified spiritual power, especially when applied to animals that did not ordinarily have them such as birds, panthers and snakes (Serpents).